We continue our betting previews for the 2018 AFL Brownlow Medal. Last week, we took a look at the Brownlow Team Votes and found some good value in a few of the betting markets. 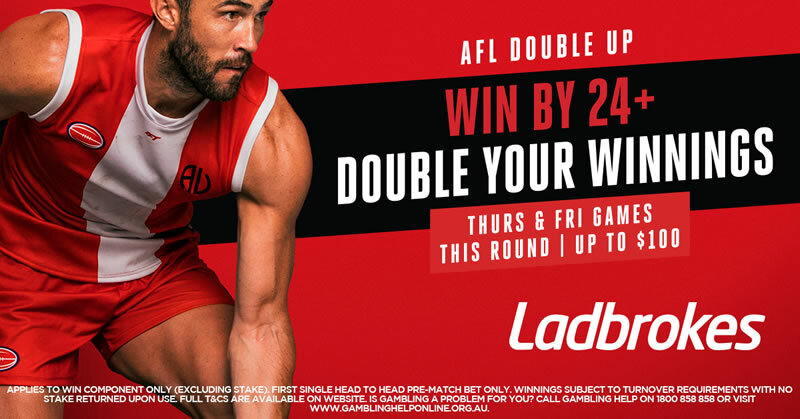 We'll have more Brownlow betting articles coming out over the coming weeks, and today we'll be looking at the "Leader After Round" betting markets. These markets refer to the leader after a nominated round. Typically these will be for Round 5 or 6, and Round 10 or 11, depending on the Australian sportsbook you are betting at. There isn't a lot of value available for these markets, and often there will be a strong chance of a tie, especially for the early rounds, so you need to keep that in mind when betting. However a lot of people do enjoy these markets so here's our betting tips! For us, there are three players who got off to fast starts during the 2018 AFL season – Nat Fyfe, Stephen Coniglio and, of course, Tom Mitchell. Fyfe is the easiest to pick with three clear best-on-grounds, and three blanks in the first six rounds. He’ll almost certainly be on 9 votes after 5 rounds and potentially in front. 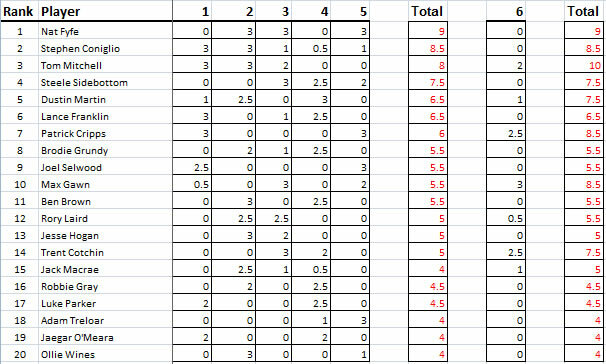 However we have Mitchell down for 2 votes in Round 6 for a lazy 45-possession victory. That should be enough to nudge Mitchell ahead after Round 6 with a pretty clear 10 votes. Coniglio is the unknown quantity. There’s a chance he’s also on 9 votes after Round 5, but may go without a vote in Round 6. The bookies seem to disagree with us on this one, and have Coniglio at juicy odds ($15 at UBET) to be leading after Round 5. I would suggest there’s some value in that if he surprise and can poll well. At that price, it's also not a bad thing if he ties and we only get half divs. The bookies like Dustin Martin to be amongst the early leaders, but I have marked Dusty a little more harshly than most. It may be a mistake but I don’t think have him as a contender in these markets. If you like Tom Mitchell, then I would lean towards taking Mitchell to be leading after Round 6 as a bet, as that appears less likely to produce a tied result. It’s pretty certain that Nat Fyfe picks up five best-on-grounds in the first 10 rounds, so that puts him on 15 votes. The question is, will anyone else be able to poll more than that? We have Patrick Cripps, Jack Macrae and Tom Mitchell all just 2-3 votes behind that, and it looks like the bookies agree with us with Fyfe a short-priced favourite ahead of the other three. Cripps and Macrae do have potential to overpoll our estimates in a couple of spots, so not overly confident in playing this market too hard, but I do like Fyfe to be leading. Mitchell is probably the only one to pick up votes in Round 11, and it might only be one vote according to our projections, so not a lot changes in our thoughts.